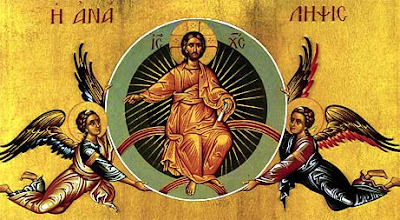 Since the blessed and glorious Resurrection of our Lord Jesus Christ, whereby the Divine power in three days raised the true Temple of God, which the wickedness of the Jews had overthrown, the sacred forty days, dearly-beloved, are today ended, which by most holy appointment were devoted to our most profitable instruction, so that, during the period that the Lord thus protracted the lingering of His bodily presence, our faith in the Resurrection might be fortified by needful proofs. For Christ's Death had much disturbed the disciples' hearts, and a kind of torpor of distrust had crept over their grief-laden minds at His torture on the cross, at His giving up the ghost, at His lifeless body's burial. For, when the holy women, as the Gospel-story has revealed, brought word of the stone rolled away from the tomb, the sepulchre emptied of the body, and the angels bearing witness to the living Lord, their words seemed like ravings to the Apostles and other disciples. Which doubtfulness, the result of human weakness, the Spirit of Truth would most assuredly not have permitted to exist in His own preacher's breasts, had not their trembling anxiety and careful hesitation laid the foundations of our faith. It was our perplexities and our dangers that were provided for in the Apostles: it was ourselves who in these men were taught how to meet the cavillings of the ungodly and the arguments of earthly wisdom. We are instructed by their lookings, we are taught by their hearings, we are convinced by their handlings. Let us give thanks to the Divine management and the holy Father who allowed the necessary slowness of belief. Others doubted, that we might not doubt. Those days, therefore, dearly-beloved, which intervened between the Lord's Resurrection and Ascension did not pass by in uneventful leisure, but great mysteries were ratified in them, deep truths revealed. In them the fear of awful death was removed, and the immortality not only of the soul but also of the flesh established. In them, through the Lord's breathing upon them, the Holy Ghost is poured upon all the Apostles, and to the blessed Apostle Peter beyond the rest the care of the Lord's flock is entrusted, in addition to the keys of the kingdom. Then it was that the Lord joined the two disciples as a companion on the way, and, to the sweeping away of all the clouds of our uncertainty, upbraided them with the slowness of their timorous hearts. Their enlightened hearts catch the flame of faith, and lukewarm as they have been, are made to burn while the Lord unfolds the Scriptures. In the breaking of bread also their eyes are opened as they eat with Him: how far more blessed is the opening of their eyes, to whom the glorification of their nature is revealed than that of our first parents, on whom fell the disastrous consequences of their transgression. And in the course of these and other miracles, when the disciples were harassed by bewildering thoughts, and the Lord had appeared in their midst and said, "Peace be unto you" , that what was passing through their hearts might not be their fixed opinion (for they thought they saw a spirit not flesh), He refutes their thoughts so discordant with the Truth, offers to the doubters' eyes the marks of the cross that remained in His hands and feet, and invites them to handle Him with careful scrutiny, because the traces of the nails and spear had been retained to heal the wounds of unbelieving hearts, so that not with wavering faith, but with most steadfast knowledge they might comprehend that the Nature which had been lain in the sepulchre was to sit on God the Father's throne. Accordingly, dearly-beloved, throughout this time which elapsed between the Lord's Resurrection and Ascension, God's Providence had this in view, to teach and impress upon both the eyes and hearts of His own people that the Lord Jesus Christ might be acknowledged to have as truly risen, as He was truly born, suffered, and died. 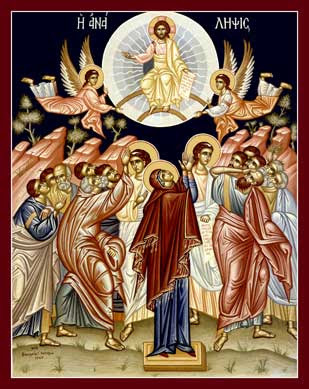 And hence the most blessed Apostles and all the disciples, who had been both bewildered at His death on the cross and backward in believing His Resurrection, were so strengthened by the clearness of the truth that when the Lord entered the heights of heaven, not only were they affected with no sadness, but were even filled with great joy. And truly great and unspeakable was their cause for joy, when in the sight of the holy multitude, above the dignity of all heavenly creatures, the Nature of mankind went up, to pass above the angels' ranks and to rise beyond the archangels' heights, and to have Its uplifting limited by no elevation until, received to sit with the Eternal Father, It should be associated on the throne with His glory, to Whose Nature It was united in the Son. Since then Christ's Ascension is our uplifting, and the hope of the Body is raised, whither the glory of the Head has gone before, let us exult, dearly-beloved, with worthy joy and delight in the loyal paying of thanks. For today not only are we confirmed as possessors of paradise, but have also in Christ penetrated the heights of heaven, and have gained still greater things through Christ's unspeakable grace than we had lost through the devil's malice. For us, whom our virulent enemy had driven out from the bliss of our first abode, the Son of God has made members of Himself and placed at the right hand of the Father, with Whom He lives and reigns in the unity of the Holy Spirit, God for ever and ever. Amen. Source: Translated by Charles Lett Feltoe. From Nicene and Post-Nicene Fathers, Second Series, Vol. 12. Edited by Philip Schaff and Henry Wace. (Buffalo, NY: Christian Literature Publishing Co., 1895.) Revised and edited for New Advent by Kevin Knight. .